Home News Business Trip Versus Posting Workers – Central-Eastern Europe Way To Conquer The Single Market Or Just A Misunderstanding? Posted workers play a crucial role in the development of the internal market of services. It hardly needs to be stressed that posting of workers is an example of a form of temporary labour migration, anticipated and stipulated by EU law. Unfortunately, the legal framework in relation to posting is considered by many as conducive to “social dumping”, illegal work etc and results in displacement effects on local businesses and workers. In order to refrain from myths it should be emphasised that if posting of workers is applied in a fair manner, it does not involve any social dumping. It is understandable that low-wage countries want to use lower labour standards as a competitive advantage when compared to high-wage countries. The most prominent example of existing blurring is a dispute that could be called ‘business trip vs. posting’ – there was and still is no clear distinction between a business trip and the posting of workers. Namely, there is a dispute whether business trip [defined as performing an official task outside the area where the employer has its registered office, or outside the regular workplace, at the employer’s request] might be considered posting. It hardly needs to be said that employers prefer the worker to be sent on a business trip due to the lower financial charges associated when compared to the costs of posting of workers abroad. In my point of view, this dispute is not relevant. The Polish legal system, like the Slovak one, does not solve the posting of employees by independent institute; posting may be carried out by other national legal instruments. Therefore, it should be stressed that PWA does not deal with national instruments potentially serving for posting. Even though that seems accurate, it leads to some confusion. The foregoing remark could be generalised. 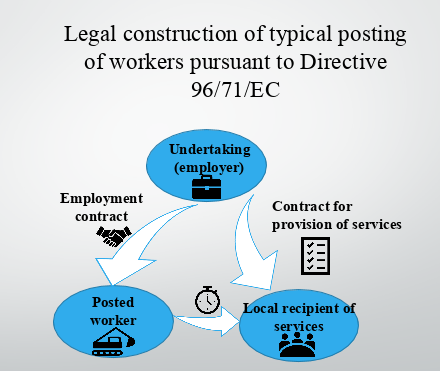 Conventionally, an employer applies domestic labour law and selects one of national legal instruments serving to work abroad their employees taking into consideration specified prerequisites in domestic labour law (business trip, temporary change of working place – unilateral or bilateral), then this carrying out the work abroad is assessed in obedience to law of host state. That is merely a consequence of the fact that European Union law (in particular the PWD) does not interfere in national legal instrument potentially serving for posting. Conversely, the EU law lays down the rules pertaining to the working conditions in a host state whereas situation before posting (how posted worker shall appear in a host state) is not covered. Furthermore, for a host state it is more than irrelevant which domestic legal instrument has been applied in a sending country. In other words, qualification of such a mobility as a pure business trip according to national labour law of sending country is irrelevant for EU labour law and the host state. If an international assignment falls within the ambit of law implementing PWD in host state it is considered posting. Thus, the crucial question that should be put: does the sent worker performs the service for a local recipient or his mobility is a consequence of employer’s order based on subordination and beyond the freedom to provide the services? The dispute ‘business trip vs. posting’ creates an incentive to further considerations. Namely, there is a spurious tendency to qualify every individual worker carrying out the work out of the country where the work is habitually carried out as a posted worker. Insightful analysis of PWD leads to the different conclusions. Firstly, PWD stipulates only a fragment of temporary labour mobility. Mobility that is inherently correlated with freedom to provide the services. Alike the godmother of PWD – Rush Portuguesa, PWD refers to the contract concluded between the foreign undertaker (employer of posted worker) and the local recipient of services. As a result, de lege lata only worker sent on basis of freedom to provide the services, shall be qualified as a posted worker. Secondly, let me present one creative example. Is it admissible to send the worker to the country where the freedom to provide the services does not exist (e.g to Kyrgyzstan)? Yes, an employee performs the work exclusively for his employer. Freedom to provide services is therefore not a prerequisite for the admissibility of sending an employee to a given country, and at most is one of the forms of such sending. A fortiori, if it is admissible to send an employee to a country where the freedom to pro-vide services does not exist, it is also permissible to send an employee to an EU country to work exclusively for his/her employer and therefore outside the scope of PWD. 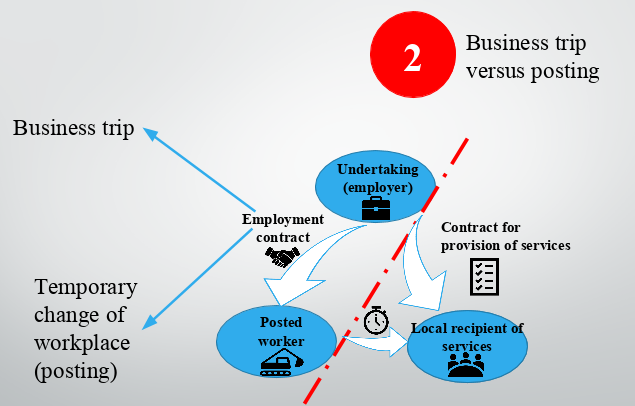 To sum up this, posting of workers should be understood as form of temporary labour migration functioning on the grounds of freedom to provide services, whereas business trip is usually an institution of domestic labour law and it might be qualified as posting if the mobility of the employee is a consequence of freedom to provide the services. But it does not always have to. J. CREMERS, J. E. DØLVIK, G.BOSCH, Posting of workers in the single market: attempts to prevent social dumping and regime competition in the EU, Industrial Relations Journal 38:6, p. 524–541; J. RYSZKA, “Social Dumping” and “Letterbox Companies” – Interdependent or Mutually Exclusive Concepts in European Union Law? XXXVI Polish Yearbook of International Law 2016, p. 209 and following; M. BERNACIAK, Social dumping: political catchphrase or threat to labour standards? ETUI Working Paper 2012.06. M. WEISS, The Future of Labour Law, in Z. HAJN, D. SKUPIEŃ (eds. ), Przyszłość prawa pracy. Liber Amicorum. Księga Jubileuszowa Profesora Michała Seweryńskiego, Łodź 2015; see also H. VERSCHUEREN, The European internal market and competition between workers, European Labour Law Journal 2015/2, Vol. 6, p. 145. See also M. SZYPNIEWSKI, M. TOMASZEWSKA, Are the minimum rates of pay of posted workers in compliance with the social market economy?, Studia Iuridica 2016, vol. 68, p. 379–391. M. HOUWERZIJL, Implementation of the posting directive in Netherlands, in R. BLANPAIN (ed.) Freedom of services in the European Union. Labour and social security law: the Bolkestein initiative, Haag 2006, p. 226. A. VAN HOEK & M. HOUWERZIJL, ‘Posting’ and ‘Posted Workers’: The Need for Clear Definitions of Two Key Concepts of the Posting of Workers Directive, Cambridge Yearbook of European Legal Studies 2011-2012, Vol. 14; F. SCHIERLE, in M. SCHLACHTER (ed.) EU Labour Law. A Commentary, Alphen aan den Rijn 2015, p. 172. Case C-113/89 Rush Portuguesa  ECR I-1417, para 15.